Longan fruit (lam yai in Thai) is wonderful chilled and served simply in a glass bowl with a spoon for dessert or as a snack. 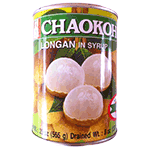 Longan is one of the most popular fruits in Thailand, with sweet and juicy white pulp. Or serve in a fruit salad.